— extract from Night Box by Jennifer Boyd, written to accompany the exhibition Chrome Villa at ANDOR. 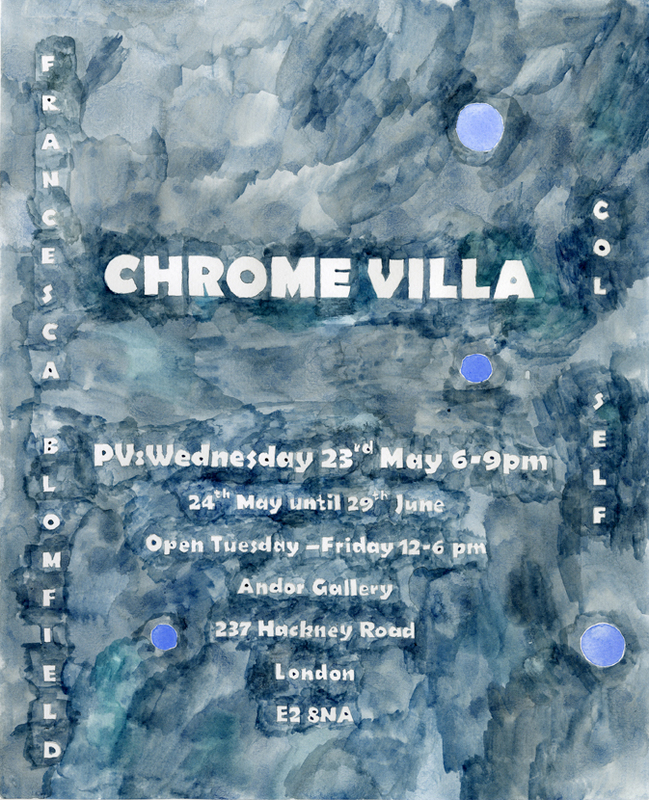 Francesca Blomfield lives and works in London and is studying MA painting at the Royal College of Art (2017-2019). Solo shows include: War Hammer, Barbican Arts Trust, London (2017) and International Treaty, The Horse Hospital, London (2015). In 2015 Francesca Blomfield was awarded the Jerwood Painting Fellowship which concluded with a U.K touring show (2016-2017). Col Self lives and works in London and is currently completing an MA in Contemporary Art Practice from the Royal College of Art (2016-18) after graduating from the Slade in 2012 in Fine Art Media. Recent exhibitions (2017/2018) include: The New Darkroom, Dyson Gallery, London; I Want My Ideal Paste, Kelder Gallery, London; The Sacred Screen/ The Sacred 419, The Square Gallery, London; 16 Artists 16 Days, The Koppel Project, London; Revive! Galitzine Mackenzie, London. Jennifer Boyd is a writer working in text and sound who has been published in Afterall, After Us and SALT. and recently released ‘A Theory for the Strange-Girl: Raw Red Text’ with COUNTRY MUSIC, and was the writer for a duo of books, ‘Skinned’ and ‘Detouched’ by artist Alice Channer.